Through its 33 Society scholarships and 22 Chapter-Awarded scholarships, ASHRAE seeks to motivate students worldwide to pursue an engineering or technology career in the HVAC&R field. The Society's Scholarship Program also serves the public interest by aiding in the education of men and women to become qualified to practice as engineers in HVAC&R. 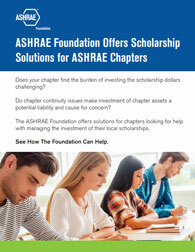 Over the course of 30 years, ASHRAE has awarded more than $2 million to over 400 deserving students.